Every day, Tung Nguyen lives in uncertainty. A resident of Orange County, California, he works as a construction helper and takes on random jobs to make ends meet. His income is unstable. But it’s not his financial insecurity that worries him most: It’s the fact that any day, he could be torn away from his wife and stepson and deported from the United States. Nguyen, 41, has been living in deportation limbo for more than five years, a reality that set in after he served 18 years in prison for a crime he committed when he was 16. While in limbo, Nguyen has advocated for reform of the immigration law that threatens to deport him and is working toward providing re-entry services for formerly incarcerated Asian Americans and Pacific Islanders (AAPIs). Nguyen came to the United States from Vietnam at around the age of 14 in the early 1990s. He didn’t speak any English at the time, and struggled to find a sense of belonging, leading to a feeling of anger he said he didn’t know existed. But after finding a group he identified with, Nguyen said his attitude toward those who bullied him became more violent. He got into a fight at school and attempted to stab someone with a dart. He was banned from the school district, he said, and charged with assault with a deadly weapon in juvenile court. It wasn’t a charge Nguyen agreed with. He said he was defending himself after being attacked by three other people. “I lost hope in the [criminal justice] system and that’s when I just went, ‘To hell with it,’” he said. Nguyen’s interest in school waned and he found himself fixated on ways to make money. He and his brothers had previously recycled cans and took up a summer job cleaning an elementary school, using the money to help their parents and buy the family’s first car. Later on, he resorted to shoplifting and breaking into people’s houses. Nguyen was 16 when the crime that sent him to prison took place. In April 1993, Nguyen and his friends took some knives and headed to a hotel to get back at a man who had disrespected his friend. Nguyen said he was the first at the door, grabbed the person who answered it, and held him at knife point. One of his friends stabbed a man, according to a description of the events released by the office of California Gov. Jerry Brown, hitting the victim’s femoral artery and killing him. He was tried as an adult in the case, he said, was found guilty, and sentenced to 25 years to life for first-degree murder and robbery. Nguyen served his sentence at multiple correctional facilities, including San Quentin State Prison where, he said, things took a turn for the better. There, he started programs that targeted juvenile lifers and parole violators and became active in facility’s Catholic community. An excerpt from California Gov. Jerry Brown's parole release review of Tung Nguyen. In his parole review decisions, Brown cited an instance when a correctional officer praised Nguyen for leading 50 civilians to safety during an inmate riot in 2006. A fight had broken out during an entertainment event that took place on San Quentin’s prison yard. Nguyen, along with other inmates, created a shield by surrounding the volunteers who were close to the stage. From there, they escorted them to the chapel. 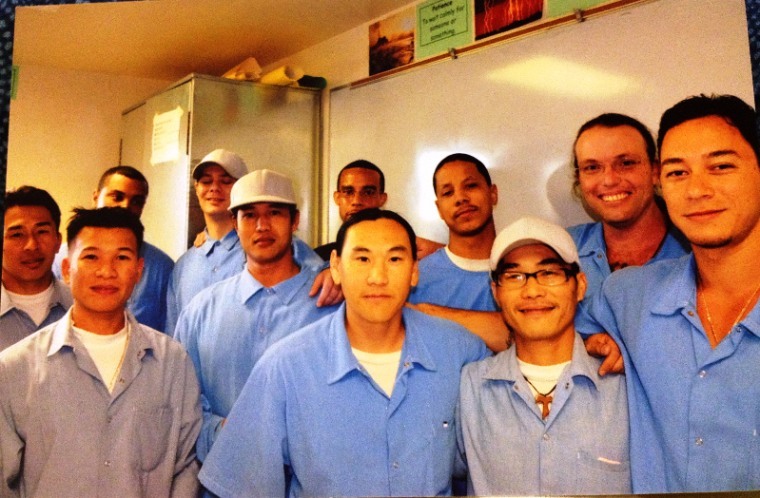 On April 13, 2011, exactly 18 years after he committed the crime, Nguyen was released from San Quentin. To date, Nguyen’s case remains the only time Brown has ever modified a term calculation by the Board of Parole Hearings to an immediate release date, Deborah Hoffman, Brown’s deputy press secretary, told NBC News. But still, Nguyen wasn’t free. Once he was released from prison, Nguyen was transferred to Immigration and Customs Enforcement (ICE) custody, detained, and faced a removal order. Twelve days later, Nguyen was released from custody and allowed to go home. He said that the immigration officer assigned to supervise his case didn’t want to hold him for much longer because he had a good record. Today, Nguyen is out of status. Because of his removal order, his green card was revoked and he is disqualified from naturalizing to become a U.S. citizen. He works jobs under the table because obtaining a work permit carries a price tag of $400. Nguyen remains in the United States only because the repatriation agreement between the U.S. and Vietnam does not allow the removal of those who arrived in the United States before July 12, 1995. Nguyen’s experience with the criminal justice system and his current immigration status have propelled him into advocacy work to reform the Illegal Immigration Reform and Immigrant Responsibility Act (IIRIRA) of 1996, a law that expanded the types of crimes that non-citizens could be deported for. Last year Nguyen testified alongside Rep. Judy Chu (D-Calif.) at a congressional briefing about the injustice of current deportation laws. He has also met with representatives from the offices of California Democrats Sen. Dianne Feinstein and former Sen. Barbara Boxer to discuss the impact the 1996 law on his life. He is also pushing for avenues to help incarcerated juveniles and formerly incarcerated Asian Americans and Pacific Islander in Orange County. Among his accomplishments in this area include helping create Senate Bill 260, a measure passed in California in 2013 that requires the reconsideration of parole for offenders who committed certain crimes prior to the age of 18. For his work on the bill, he was recognized with the Unsung Hero Award by the Youth Law Center in San Francisco. Nguyen said his current project seeks to overcome the stigma and shame of incarceration. If selected for the Soros Justice Fellowship, Nguyen would be granted between $58,700 and $110,250 over a period of 18 months. He hopes to create the foundation necessary to begin forming a non-profit group that will be able to run on its own once his funding expires. Apart from that, he plans to continue advocating for incarcerated juveniles and formerly incarcerated AAPIs who may be in situations similar to his. Since being released from prison, Nguyen has gotten married and now has a stepson. The possibility of being forcefully taken away from his family at any time is what’s motivated him to become more vocal about his predicament, despite the spotlight it shines on his life.